Cuba, Nicaragua, and Venezuela are today threatened by US imperialism. The first salvo of the modern Age of Imperialism started back in 1898 when the US seized Cuba along with Puerto Rico and the Philippines in the Spanish-American War. The Age of Imperialism, as Lenin observed, is characterized by the competition of the various imperial powers for dominance. That inter-imperialist rivalry led to World War I. Lenin called those putative socialists who supported their own national imperialist projects “social imperialists.” Social imperialism is a tendency that is socialist in name and imperialist in deed. Imperialism and its social imperialist minions are still with us today. The United States emerged after World War II as the leading imperialist power. With the implosion of the Socialist Bloc around 1991, US hegemony became even more consolidated. Today the US is the undisputed world’s hegemon. Hegemony means to rule but even more so to dominate. As the world’s hegemon, the US will not tolerate neutral parties, let alone hostile ones. As articulated in the Bush Doctrine, the US will try to asphyxiate any nascent counter-hegemonic project, no matter how insignificant. In the Caribbean, for instance, the US snuffed out the leftist government of Grenada in 1983 in what was code named Operation Urgent Fury. Grenada has a population smaller than Vacaville, California. The only powers that the world’s hegemon will tolerate are junior partners such as Colombia in Latin America. The junior partner must accept a neoliberal economic regime designed to serve the interests of capital. Structural adjustment of the economy is demanded such that the neoliberal “reforms” become irreversible; so that you can’t put the toothpaste back in the tube. Colombia recently joined NATO, putting that junior partner’s military under direct interaction with the Pentagon bypassing its civilian government. The US has seven military bases in Colombia in order to project – in the words of the US government – “full spectrum” military dominance in the Latin American theatre. Needless-to-say, no Colombian military bases are in the US. Nor does any other country have military bases on US soil. The world’s hegemon has some 1000 foreign military bases. Even the most sycophantic of the US’s junior partners, Great Britain, is militarily occupied by 10,000 US troops. Venezuela, Nicaragua, and Cuba are targeted by US imperialism because they pose what might be called the “threat of a good example;” that is, an alternative to the neoliberal world order. These countries are suffering attacks from the imperialists because of the things they have done right, not for their flaws. They are attempting to make a more inclusive society for women, people of color, and the poor; to have a state that, instead of serving the rich and powerful, has a special option for working people, because these are the people most in need of social assistance. The US imperialist rhetoric is backed with action. In 2015, US President Obama declared Venezuela an “extraordinary threat to US security” and imposed sanctions. These sanctions have been extended and deepened by the Trump administration. The US has likewise subjected Cuba to sanctions in a seamless bipartisan policy of both Republicans and Democrats for over half a century. Now the US is the process of imposing sanctions on Nicaragua. Unilateral sanctions, such as those imposed by the US, are illegal under the charters of both the UN and the Organization of American States, because they are a form of collective punishment targeting the people. The US sanctions are designed to make life so miserable for the masses of people that they will reject their democratically elected government. Yet in Venezuela, those most adversely affected by the sanctions are the most militantly in support of their President Nicolás Maduro. Consequently, the Trump administration is also floating the option of military intervention against Venezuela. The recently elected rightwing leaders Bolsonaro in Brazil and Duque in Colombia, representing the two powerful states on the western and southern borders of Venezuela, are colluding with the hegemon of the north. The inside-the-beltway human rights organizations, such as Human Rights Watch, fail to condemn these illegal and immoral sanctions. They lament the human suffering caused by the sanctions, all the while supporting the imposition of the sanctions. Nor do they raise their voices against military intervention, perhaps the gravest of all crimes against humanity. 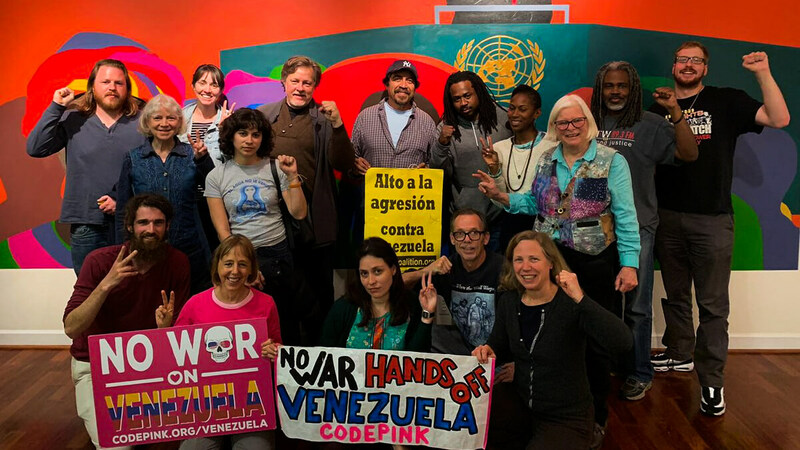 Liberal establishments such as the advocacy group Washington Office on Latin America (WOLA) try to distinguish themselves from hardline imperialists by opposing a military invasion in Venezuela while calling for yet more effective and punishing sanctions. In effect, they play the role of the good cop, providing a liberal cover for interference in the internal affairs of Latin American nations. These billionaire-funded NGOs have a revolving-door staffing arrangement with the US government. So it is not surprising that they will reflect Washington’s foreign policies initiatives. But why do some organizations claiming to be leftist so unerringly echo the imperialists, taking such umbrage over Venezuela, Cuba, and Nicaragua while ignoring far greater problems in, say, Mexico, Colombia, and Honduras, which are US client states? Let’s take Nicaragua. A year ago, the polling organization Latinobarómetro, found the approval rating of Nicaraguans for their democracy to be the highest in Central America and second highest in Latin America. Nicaragua is a member of the anti-imperialist Bolivarian Alliance for the Peoples of Our America with Cuba, Venezuela, Bolivia, and some Caribbean states. Speaking at the UN, the Nicaraguan foreign minister had the temerity to catalogue the many transgressions of what Martin Luther King called “the greatest purveyor of violence in the world” and express Nicaragua’s opposition. Second highest economic growth rates and the most stable economy in Central America. Only country in the region producing 90% of the food it consumes. Poverty and extreme poverty halved; country with the greatest reduction of extreme poverty. Reached the UN Millennium Development Goal of cutting malnutrition by half. Nicaraguans enjoyed free basic healthcare and education. Illiteracy had been virtually eliminated, down from 36% in 2006 when Ortega took office. Average economic growth of 5.2% for the past 5 years (IMF and the World Bank). Safest country in Central America (UN Development Program) with one of the lowest crime rates in Latin America. Highest level of gender equality in the Americas (World Economic Forum Global Gender Gap Report 2017). Did not contribute to the migrant exodus to the US, unlike neighboring Honduras, El Salvador, and Guatemala. Unlike its neighbors, kept out the drug cartels and pioneered community policing. In April of this year, all of this was threatened. The US had poured millions of dollars into “democracy promotion” programs, a euphemism for regime change operations. Suddenly and unexpectedly, a cabal of the reactionary Catholic Church hierarchy, conservative business associations, remnants of the US-sponsored Contras, and students from private universities attempted a coup. Former members of Ortega’s Sandinista Party, who had long ago splintered off into political oblivion and drifted to the right, became effective propagandists for the opposition. Through inciting violence and the skillful use of disinformation in a concerted social media barrage, they attempted to achieve by extra-legal means what they could not achieve democratically. We who live in the “belly of the beast” are constantly bombarded by the corporate media, framing the issues (e.g., “humanitarian bombing). Some leftish groups and individuals pick up these signals, amplify, and rebroadcast them. While they may genuinely believe what they are promulgating, there are also rewards such as funding, media coverage, hobnobbing with prominent US politicians, and winning awards for abhorring the excesses of imperialism while accepting its premises. They try to differentiate their position from the imperialists by proffering a mythic movement, which will create a triumphant socialist alternative that fits their particular sect’s line: chavismo without Maduro in Venezuela, sandinismo without Ortega in Nicaragua, and the Cuban Revolution without the Cuban Communist Party in Cuba. The political reality in Latin America is that a rightwing offensive is attacking standing left-leaning governments. President George W. Bush was right: “Either you are with us, or you are with the terrorists.” There is no utopian third way. Each of us has to determine who are the real terrorists, as the juggernaut of US imperialism rolls out a neoliberal world order. For now, the coup in Nicaragua has been averted. Had it succeeded, chaos would have reigned. As even the most ardent apologists for the opposition admit, the only organized force in the opposition was the US-sponsored rightwing which would have instigated a reign of terror against the Sandinista base. The US would prefer to install stable rightwing client states or even military dictatorships. But if neither can be achieved, chaos is the preferred alternative. Libya, where rival warlords contest for power and slaves are openly bartered on the street, is the model coming to Latin America. Chaos is the new imperialist game plan, especially for Bolton’s so-called troika of tyranny. The imperialists understand that the progressive social movements in Venezuela, Nicaragua, and Cuba are too popular and entrenched to be eradicated by a mere change of personnel in the presidential palace. Much more drastic means are envisioned; means that would make the bloody aftermath of the US-backed Pinochet coup in 1973 in Chile pale by comparison. In Venezuela, for example, the opposition might well have won the May 2018 presidential election given the dire economic situation caused in large part by the US sanctions. 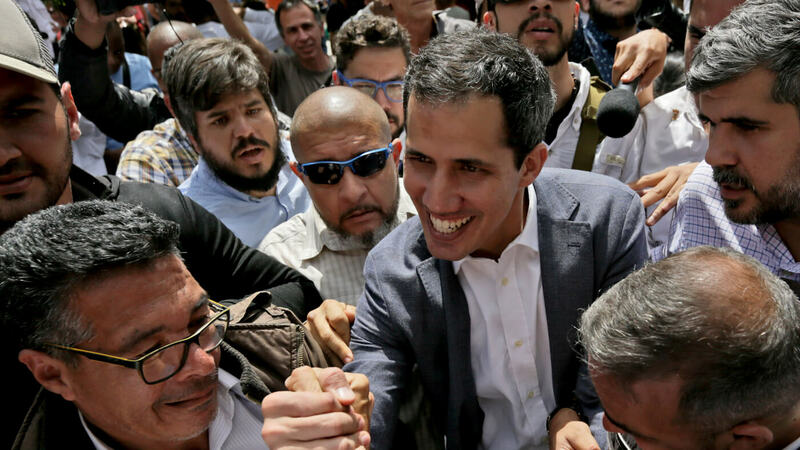 The opposition split between a moderate wing that was willing to engage in electoral struggle and a hard-right wing that advocated a violent takeover and jailing the chavistas. When Venezuelan President Maduro rejected the US demand to call off the elections and resign, he was labelled a dictator by Washington. And when moderate Henri Falcon ran in the Venezuelan presidential race on a platform of a complete neoliberal transition, Washington, instead of rejoicing, threatened sanctions against him for running. The US belligerently floated a military option for Venezuela, stiffened the suffocating sanctions, and tipped the balance within the Venezuelan opposition to the radical right. The US is not about to allow Venezuela a soft landing. Their intent is to exterminate the contagion of progressive social programs and international policy that has been the legacy of nearly two decades chavismo. Likewise, for Cuba and Nicaragua. We should also add Bolivia in the crosshairs of the empire. We’ve seen what Pax Americana has meant for the Middle East. The same imperial playbook is being implemented in Latin America. Solidarity with the progressive social movements and their governments in Latin America is needed, especially when their defeat would mean chaos. Roger Harris is on the board of the Task Force on the Americas, a 33-year-old anti-imperialist human rights organization, and is active with the Campaign to End US-Canadian Sanctions Against Venezuela.